Now available !!! Call 303-516-9118 to order !!! those made at major studios." 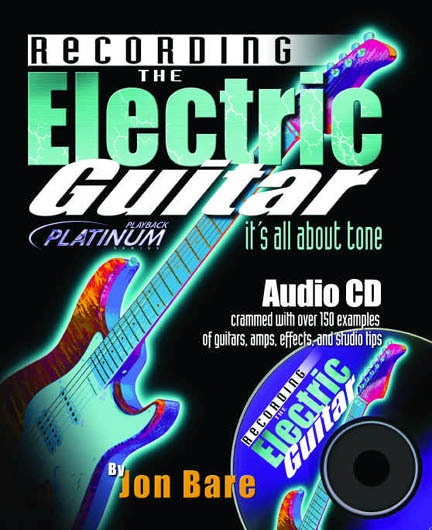 Recording The Electric Guitar is a combination CD and book designed for recording guitarists and those who want to capture a great sound on tape (or whatever medium). It is part of the Playback Platinum Series of CD's and books Published by Music Maker Publications, who also publish Recording Magazine. The magazine is currently running a full-page spread advertising the CD/book. In the July, 2001 issue of the magazine there was an article on multiple miking techniques, taken from chapter 4 of the book. The focus of the July issue was on guitars -- so the timing was excellent. Containing nearly 200 audio examples and other musical tidbits, along with a full-length voice over by the author explaining what you are hearing and why it is important, the CD is a treasure trove of information about recording. Packaged with the CD is an accompanying book which does not duplicate the information on the CD -- rather, it expands upon it. The book contains numerous pictures and photographs so you can see examples of what you are listening to. Designed for the educational market, this book and CD provides excellent curricular material for recording schools and workshops worldwide. Anyone who puts a mic on a guitar amp and presses Record should read this book. That includes every guitarist who has a little home studio and wants to get a decent sound on tape or disc. Which brings up the question -- isn't there a guitarist on your holiday shopping list? read it! I always learn something from him." Chet McCracken, former drummer—The Doobie Brothers. Get your copy of Jon Bare's "Recording the Electric Guitar - it's all about tone"
for only $29.95 (plus $3.00 for S&H). Call now! 303-516-9118 Order yours today!